DAYTONA BEACH, Fla. (March 15, 2018) – The world’s elite dirt track motorcycle racers entered the 2018 American Flat Track opener at Daytona International Speedway having spent practically every available moment for the past several months searching for answers after getting roundly trounced by defending Grand National Champion Jared Mees last year. One round into the 2018 AFT Twins presented by Vance & Hines season, they’re still looking. The target on Mees’ back, along with the extra weight of the No.1 plate on his Indian Motorcycle Rogers Racing Sidi Scout FTR750, only appeared to spur the champ forward in Thursday night’s Harley-Davidson TT presented by Russ Brown Motorcycle Attorneys at DAYTONA. If anything, this year’s bigger, better, and faster DAYTONA TT layout played even more surely into Mees’ hands. He called upon an unparalleled combination of pace, determination and daring to force his way into the lead early and then fend off any challenge from there to immediately seize the early-season title advantage. Mees came into contact with fellow Indian Wrecking Crewman Brad Baker (No. 6 Indian Motorcycle Racing backed by Allstate Scout FTR750) multiple times over the race’s opening laps as he looked for a way into the lead as a group of five riders bunched up at the front. He ultimately made the decisive maneuver coming off the jump, jamming through as the two entered the switchback that immediately followed. Mees was quickly followed through by MotoAmerica superstar JD Beach (No. 95 G&G Racing/Rickdiculous Racing/Team95 Yamaha FZ-07). Once into second, Beach showed off the skills that allowed him to reign supreme in December’s Superprestigio Dirt Track, cutting into Mees’ gap during the middle portions of the race. However, after the lead narrowed to around a half-second, Mees wicked it back up and safely powered home to the checkered flag. “In the very beginning I had to get physical with Brad a couple times — I had to get by,” said Mees. “Over the jump I had a real good line, which allowed me to get aggressive. To come out and win the DAYTONA TT two years in a row is just huge. Moments after looking like Mees’ biggest threat, Beach became his biggest helper as he stole precious second-place points from series’ full-timers hoping to contend for the 2018 crown. TT master Henry Wiles (No. 17 Willy Built/Bandit Industries Kawasaki Ninja 650) had the speed to battle for a record-extending 19th TT victory — he just didn’t have the start. Wiles ran into Turn 1 mired in sixth position and found himself playing catch-up for the remainder of the race. While tracking down Mees and Beach proved a feat too big for even Wiles, he did slash past the likes of Bryan Smith (No. 4 Indian Motorcycle Racing backed by Allstate Scout FTR750), Briar Bauman (No. 14 Zanotti Racing Kawasaki Ninja 650), and early-leader Baker to secure the final spot on the podium. The third-place finish was Wiles’ second at the DAYTONA TT in as many years. He said, “I just had to pass too many people. I was watching the leaders gap away while I was working my way up… I was watching Jared, and I thought, ‘I can’t let him get out.’ Once he did, I was able to pass a few more people, but I came around this last corner and saw the gap he had, and I knew I had to start pulling some rabbits. I was trying to hustle. Bauman continued to build his resume as one of the better TT riders in the paddock with his fourth-place finish, while Baker rounded out the top five. That result may not have been what the factory Indian rider envisioned after storming to the holeshot from pole, but it’s certainly an upgrade over last year’s DAYTONA TT opener in which he failed to advance to the Main Event. Jake Johnson (No. 5 Estenson Racing Yamaha FZ-07) made a solid debut with the Estenson Racing squad in sixth. He was followed by Davis Fisher (No. 67 Bob Lanphere Beaverton Motorcycles Kawasaki Ninja 650) and a rejuvenated Kenny Coolbeth (No. 2 Nila Racing, Columbia Avionic Indian Scout FTR750). Former champ Smith halted his slide down the order at 9th after running inside the top five early, while Robert Pearson (No. 27 R/J Performance/Hite Trucking Indian Scout FTR750) made it five Indian FTR750s in the top 10. 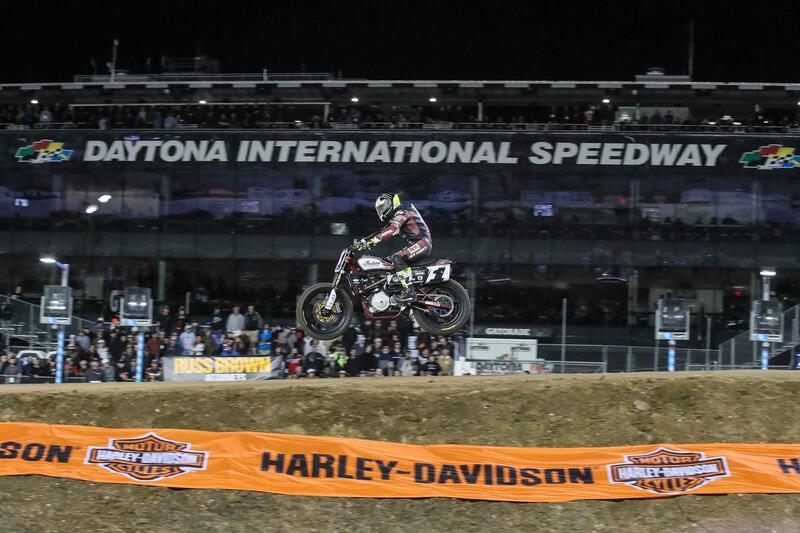 The projected AFT Singles title favorites were forced out of the spotlight in the 2018 season opener; the primary agents of speed and drama on this night under the lights at Daytona International Speedway were the TT specialists and the one-off wild cards. The wild cards in particular raced like they had nothing to lose. With blistering speed on their side, MotoAmerica star Jake Lewis (No. 185 Team M4 Suzuki RM-Z450), British Supersport contender James Rispoli (No. 143 RMR/Al Lamb’s Dallas Honda CRF450R), and two-time Spanish Dirt Track champ Ferran Cardús (No. 377 Number 6/Diesel Minnesota Honda CRF450R) locked down the top three positions on the grid and looked every bit capable of doing the same to the podium. However, all three crashed in an eventful, twice red-flagged Main Event, which opened the door for others to rush through. In fact, Rispoli forced a red flag moments after the original start and was then the innocent victim of a second red-flag incident himself, which ended his night early. Cardus had the misfortune of saving his fall(s) for the third and final leg of the race, costing him a shot at victory. Lewis got the holeshot in the first start but was brought down from behind in Turn 1 by Rispoli. As a result, he was forced to restart from Row 4 but still somehow managed to fight his way up to fourth at the checkered flag. Lewis wasn’t completely innocent himself. Earlier during the Semi, he clashed with defending class champ Kolby Carlile (No. 1 Estenson Racing Yamaha YZ450F) who fell as a result of the contact. While Carlile managed to grit his way back through to a qualifying position, he injured his shoulder in the spill and was unable to take part in the Main Event. However, Carlile could take some solace in the fact that 2017 race winners Shayna Texter (No. 52 ST52 Husqvarna FC450) and Tanner Dean (No. 38 Walrath Racing/See See Motorcycles Honda CRF450R), along with four-time ’17 race runner-up Tristen Avery (No. 16 Ron Ayers/Mr. Sign Honda CRF450R), failed to advance to the Main in the face of an extremely stacked field packed full of TT specialists and visiting road racers. The fact that fellow title hopefuls Brandon Price (No. 92 Parkinson Brothers Racing/DPC Racing Honda CRF450R), Ben Lowe (No. 20 Bruce Lowe Excavating Kawasaki KX450F), Ryan Wells (No. 94 RMR/Al Lamb’s Dallas Honda CRF450) and Kevin Stollings (No. 99 Roof Systems Honda CRF450R) ultimately finished between seventh and 15th also helped to minimize the damage of Carlile’s season-opening scratch. Instead, the evening belonged to the AFT Singles category’s two preeminent TT aces, Dan Bromley (No. 62 Big Momma & Daddy Deep Pockets Racing KTM 450 SX-F) and Jesse Janisch (No. 132 Roof Systems/West Bend Harley-Davidson-backed Yamaha YZ450F). The two first escaped from the chaos and then from the field, opening up a massive gap to third as they battled for the lead. Bromley gradually worked his way free of Janisch and set sail to a convincing DAYTONA TT triumph. Despite being caught up in the early melee which forced him restart from Row 4, Shane Narbonne (No. 27 JMC Motorsports/All Phase Chimneys Honda CRF450R) successfully slashed his way through the pack and held off Lewis for third to claim his first career AFT Singles podium. The American Flat Track paddock will next head up I-65 for the Harley-Davidson Atlanta Short Track presented by Hellbender Harley-Davidson on Saturday, April 7 in Woodstock, Ga., for Round 2 of the 2018 season. Live coverage can be viewed on FansChoice.tv beginning at 2:00 p.m. ET with Opening Ceremonies scheduled for 6:00 p.m. ET. Tickets are on sale now and can be purchased at https://www.showclix.com/event/atlanta-short-track. Fans can keep up-to-date with American Flat Track on Facebook (@American Flat Track), Twitter (@AmericanFlatTrk) and Instagram (@AmericanFlatTrack). AFT mobile apps are available for iPhone on the App Store and for Android at Google Play. For more information, please visit http://www.americanflattrack.com.